Some of Jump!Star’s organizational partners and creative team members celebrating after Constellate 2 in Kansas. From left: Kate Van Steenhuyse, Sandy Dorsey, Christy Davis, Alan Calpe, Connie Bonfy, George Ferrandi, Kristin Beal, Jee Young Sim, Mirah. Jump!Star is an initiative to collaborate on the invention of customs to celebrate the transition of our North Star. 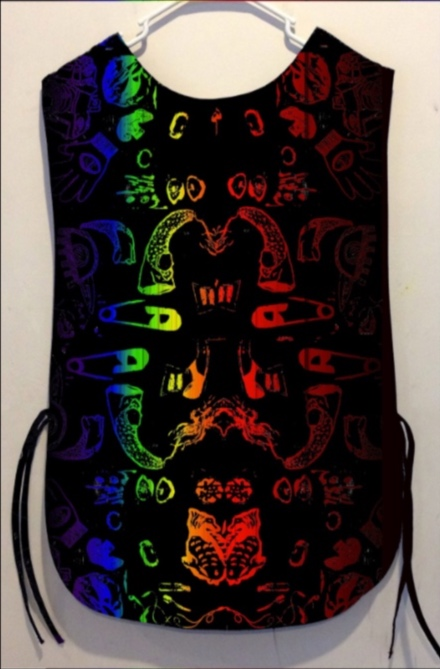 The project takes the form of a series of themed “Constellates.” During these Constellates we introduce you to the project and to our crew, and invite you to join us in inventing the cultural traditions and actions that will mark the changing of the Pole Star. The Jump!Star team works with members of the local community to invent the costumes and regalia that will accompany the festivities of this future holiday. New York artist and Jump!Star’s choreography director Alan Calpe gives a presentation on costumes used in celebrations around the world. Creative Director George Ferrandi, of Brooklyn, NY, talks about about Carl Sagan and Ann Druyan’s galactic mixtape, the Voyager Golden Records. In the roundtable, participants discuss possible time-capsule objects that represent this moment in time and offer clues to future generations. Together, we host a cyanotype (sun-print) workshop in which we print drawings of objects culled from our time-capsule conversation onto large bolts of fabric that will be used to construct costumes for the culminating event and beyond. Imprints of the NOW, projections of THE FUTURE! 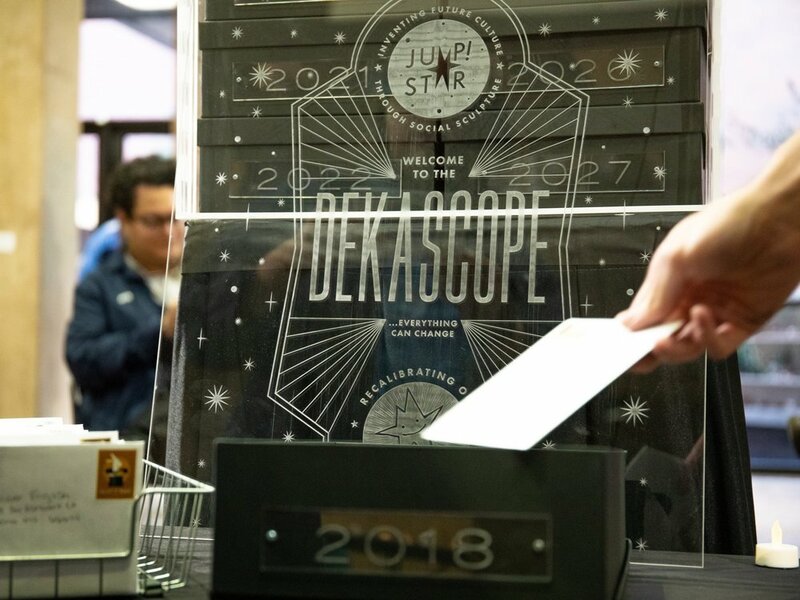 In the Kansas iteration of Jump!Star, Harvester Arts hosted the Jump!Star team for Constellate 1 presentations, and our cyanotype workshop was developed with Wichita State University’s Art, Design and Creative Industry students. 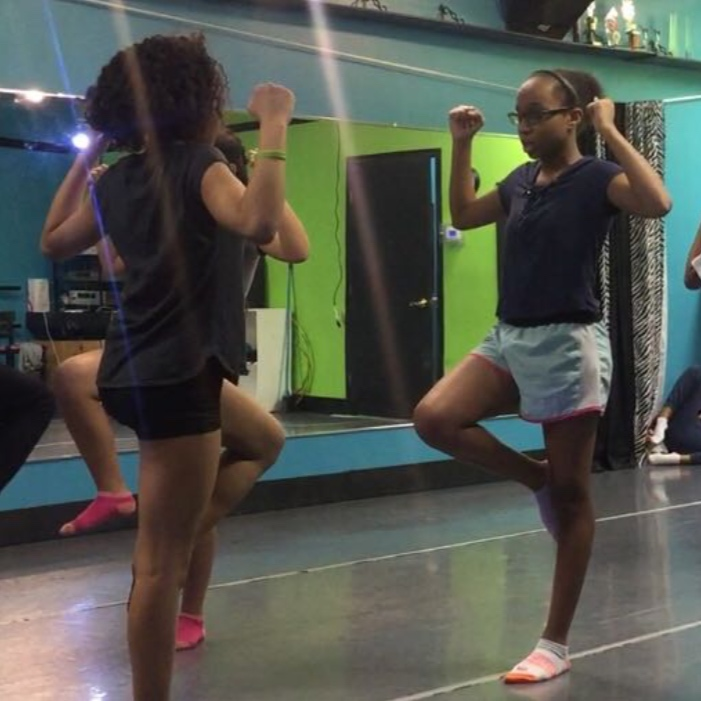 The local community works with the Jump!Star creative team in inventing the rhythms, sounds, and movement that will accompany the future holiday. 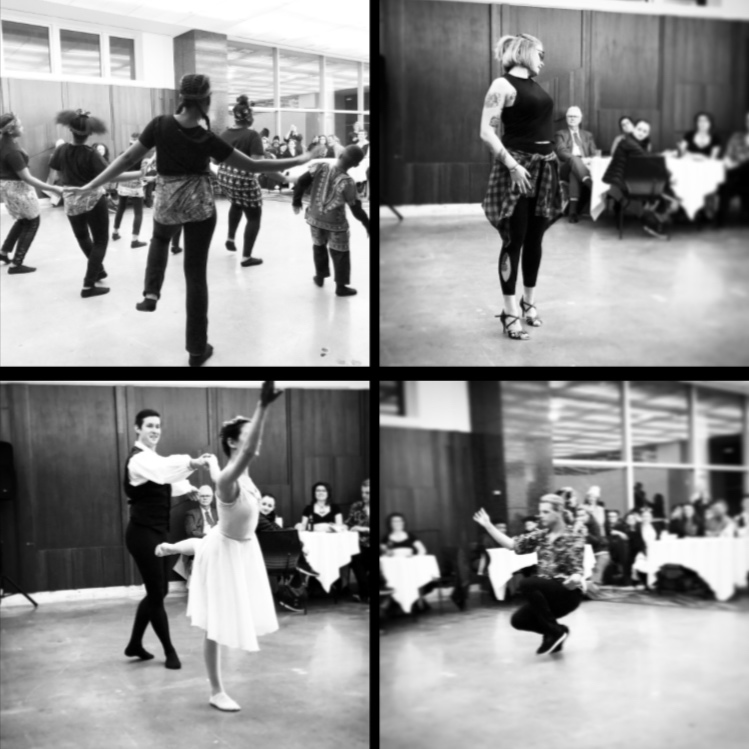 At this gathering the audience is introduced to the 11+1 potential future pole stars, and asked to help assign signature movements and gestures that will accompany and define each of these characters. In our Kansas iteration, our team ethnomusicologist Dr. Dina Bennett spoke about the significance of the North Star in African-American musical expression. Local dancers of many genres and traditions performed micro-dances that the audience watched with a mind toward isolating gestures that could represent the various pole star characters. In the round table discussion, team leaders synthesized the group discussions and culled gestures from the live performances that would serve as potential Jump!Star movements. Finally, local partners hosted a blow-out barn dance at Pioneer Bluffs. The first half of the evening featured traditional dancing and music, and the second half featured the new Jump!Star choreography performed to “Sound Signatures” written for each star by Jee Young Sim and performed by incredible local performers Susan Mayo, Rob Loren, Kelly Werts, Randy Zellars, Von Hansen, Seth Carrithers, and Matt Kirby. Musician Mirah, based in Brooklyn, NY, is writing three anthems for Jump!Star—one to sing Goodbye to our current North Star (Polaris), one to say Hello to our next (Gamma Cephei) and one to introduce us to all twelve eventual North Stars. Jherek Bischoff, Los Angeles-based musician and composer, is writing a symphony informed by Jump!Star’s themes. Both Jherek and Mirah’s music will premiere at Jump!Star’s Kansas culmination, in conjunction with Symphony in the Flint HIlls’ signature event on June 15th, at Irma’s Pasture near Bazaar, KS. Berlin-based visual and sound artist Jee Young Sim, who developed individual “Sound Signatures” for each of the eventual North Stars, informed by their character traits. ((( LISTEN TO JEE’S SOUND SIGNATURES. Develop the objects and sculptural forms that will be used to ritualize future Jump!Star events. George Ferrandi leads discussions on performative objects, the secret life of statues, festival objects from around the world, objects of personal ritual, and Japan’s Nebuta Matsuri sculpture tradition. Participants learn the traditional technique of building in the Nebuta style. 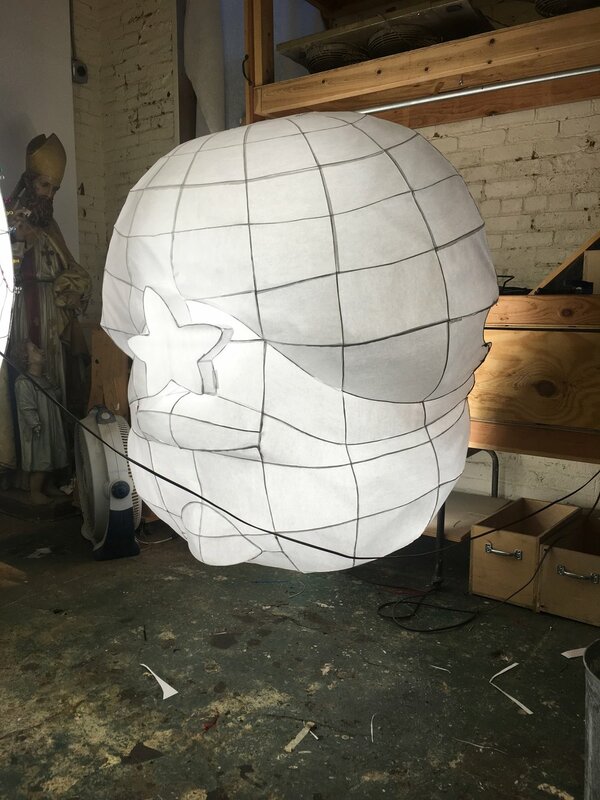 This technique has been employed across the country by the Jump!Star team to develop large-scale illuminated sculptures with communities in Fredericksburg, VA, State College, PA, Brooklyn, NY, Unityville, PA and Wichita, KS. We explore traditions of food and farming, and imagine new traditions of cooking and growing. Jump!Star’s climatologist Sonali McDermid presents the history of industrial agriculture and projected models for future farming. Fred Iutzi from the Land Institute of Salina, KS, discusses perennial polyculture and sustainability. We continue our conversations around sustainability by learning about and sampling cricket flour and other alternative proteins. 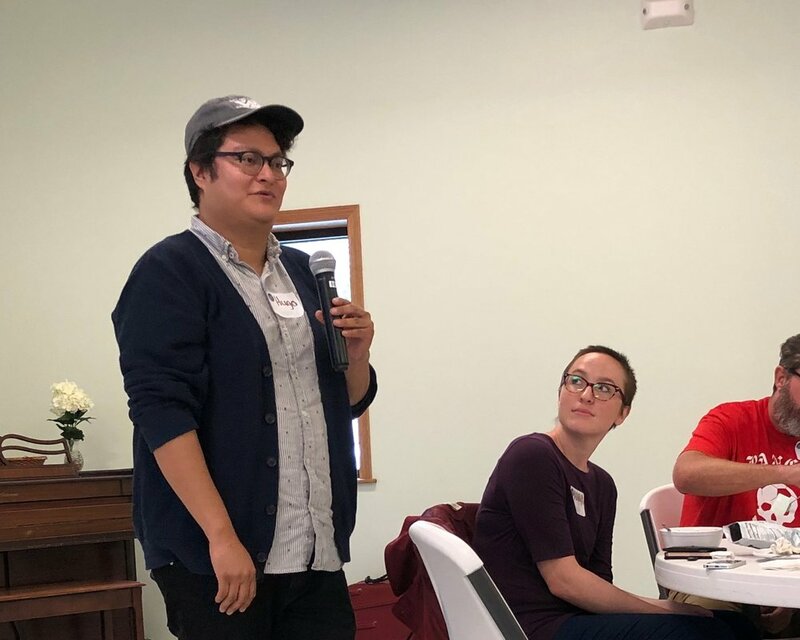 We explore local food traditions by asking community members to bring a dish from their family cookbook to a potluck and a discussion of how food connects us to the past and to the future. 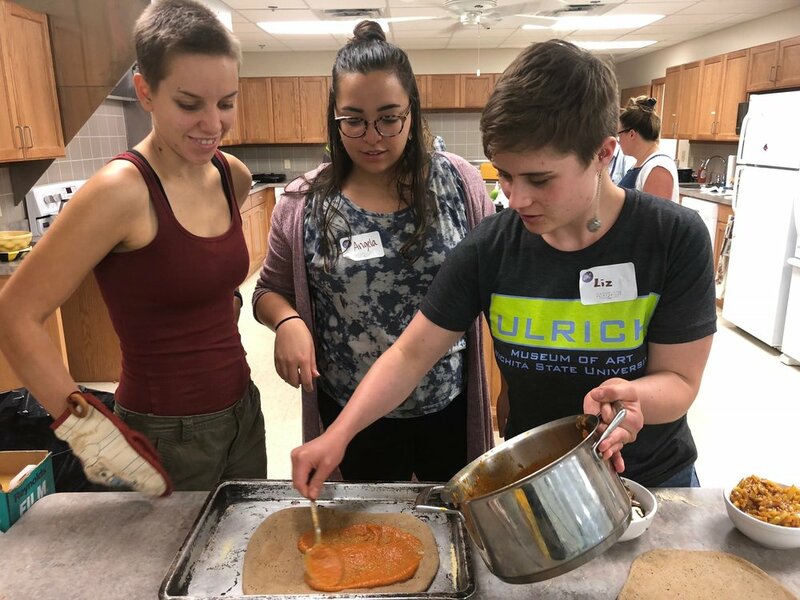 Participants work with local restaurateurs to invent future-traditional recipes using sustainable future ingredients, including possible grain alternatives like Kernza and cricket flour. Join us for a starlit screening of 2001: A Space Odyssey on April 27, 2019, in Elmdale, Kansas. The film will be preceded by a panel discussion, “From Star Trek to Your Cell Phone and Back: How Sci-Fi Thinking Impacts Pop Culture "
In addition to the Constellates, one way Jump!Star facilitates recalibrating the human relationship with time is through projects that take tiny steps towards rethinking it, like The Dekascope. Join us under the stars (both real and projected) for a night of stories from the sky. The evening will begin as the sun sets and Dr. Daniel Wildcat, President (acting) of Haskell Indian Nations University, will tell a story that starts with this most vital star. Then, we’ll gather in the sparkling dark to talk with Jana Grcevich, astrophysicist and co-author of A Vacation Guide to the Solar System, about how a star is born, and the physical forces causing our North Star to change (which inspires the Jump!Star project). Next, we’ll take part in a celestial session led by George Ferrandi, Jump!Star’s creative director, who will reveal the intimate myths of our eventual North Stars and their origin stories within the Jump!Star cosmology. Then, with the help of our “Flash!Packet,” participants will be invited to develop a deck of North Star Stories from their own lives, using the Pole Star characters as points of departure. Dr. Chinyere Okafor, Director of the Center for Women’s Studies at WSU, will lead this discussion with participants using Jump!Star’s version of an illustrated flashcard workbook for creative writing. Weather permitting, Jerelyn and Paul Ramirez of the Kansas Astronomical Observers will provide telescopes to guide us in North Star spotting.